Degenerative joint disease (DJD) affects numerous (predominantly older) cats and, if untreated, has been associated with long-term pain and poor quality of life. Geriatric cats may be less active, but getting old must be differentiated from being painful or developing another medical problem. Chronic joint pain can affect mobility (eg, jumping, accessing a tall litter box), and the cat may appear stiff or clumsy (eg, failing jumps). Cats with DJD may also sleep more and change rest environments because of accessibility challenges, such as climbing (Figure 1). They may have reduced muscle mass (Figure 2), be less playful, more reclusive, and more unkempt (from lack of grooming). Figure 1. The gray and white cat’s preferred spot before the development of DJD was on top of the couch (A). With the onset of DJD, he chose to be alone and occupy the floor, likely because of difficulty accessing elevated resting places (B). Figure 2. 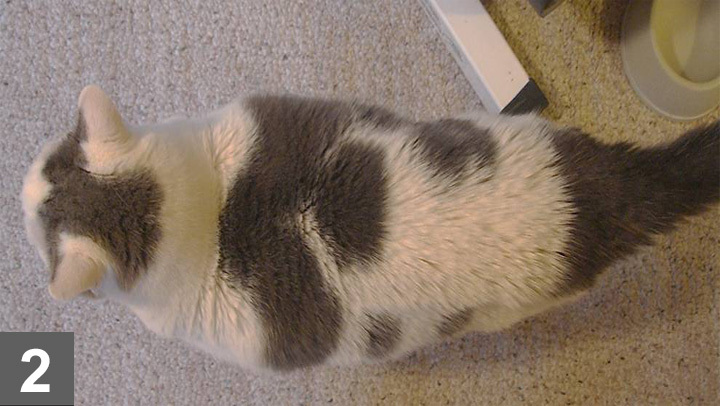 A cat (see Figure 1) had DJD affecting the hips. This view shows narrowness in the pelvic end, compared with the front, from muscle wasting. Institute complementary therapies. Institute NSAID therapy. Educate the client. Consider disease-modifying agents. Consider other drugs. Follow up and monitor the patient. Suggest therapeutic joint-health diets Dose appropriately. Encourage maintaining a healthy weight. If necessary, perform or refer for surgery. Treatment can be divided into two main categories: pharmaceutical and nonpharmaceutical. However, a combination is often best (see Treatment Options), with treatment tailored for each patient’s clinical assessment. When treating DJD, repeated trial and error may be necessary to discern the best strategy, and treatment may change as DJD progresses or other diseases present. Although many diseases of geriatric cats are incurable and treatment may be supportive or palliative, clinicians can provide good quality of life. 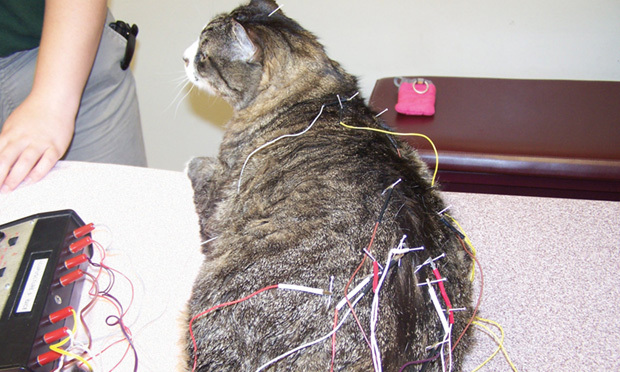 Acupuncture may promote patient comfort and mobility, and cats are more tolerant of this treatment than is often assumed (Figure 3). Figure 3. 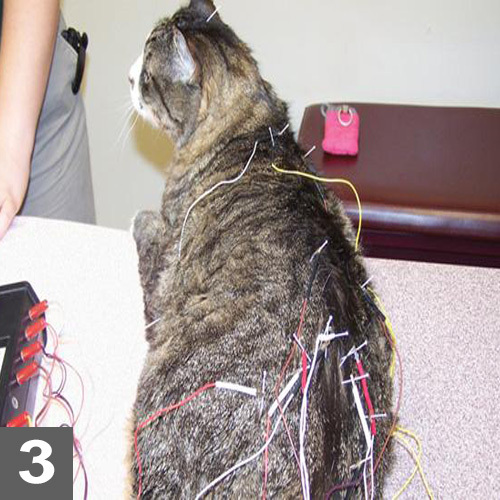 This cat is undergoing electroacupuncture; many cats are tolerant of this procedure and, like this cat, require minimal restraint. 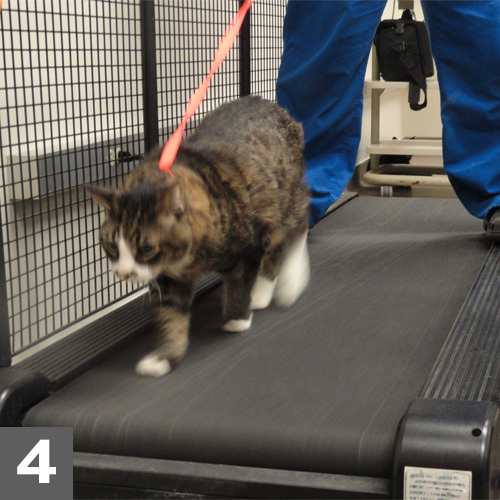 Physical rehabilitation exercises are applicable for cats (Figure 4). Figure 4. Using a treadmill is one option for physical rehabilitation. Anecdotal reports support positive effects from polysulfated glycosaminoglycan injections in cats. Although this treatment is licensed in the United States for use in dogs, it is off-label in cats. 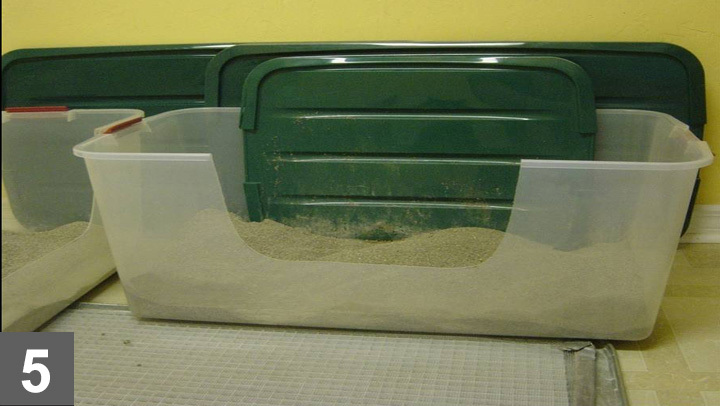 Litter box, food, and water should be accessible for mobility-impaired cats (Figure 5). Figure 5. This litter box has been modified for easier access. Access to preferred perches reinforces continuation of favorite activities (Figure 6). Figure 6. A step provides easier access to a preferred perch. An enriched environment can encourage exercise, which can help maintain muscle tone and mass, while possibly decreasing pain associated with joint disease. Towers, toys, and hidden food can stimulate foraging, hunting, and play behaviors. Increased client–cat interaction with toys, gentle range-of-motion exercises, massage, and grooming can enrich patient life. Engagement can also emphasize that clients are helping their pet, even though DJD is untreatable. This treatment requires general anesthesia and may be costly. Well controlled, prospective, published feline studies on stem cell therapy for DJD are lacking. Because multiple joints are usually affected and total joint replacements are not commonly performed in cats, surgery is seldom recommended. Currently, NSAIDs are the only drugs supported by evidence-based medicine to alleviate pain and improve mobility in cats with DJD. In the United States, it is often prescribed (off-label) to cats with musculoskeletal pain. In Europe and Australasia, it is approved for long-term treatment in cats. In 2 studies on meloxicam in cats with DJD and stable CKD, there was no evidence of adverse effects, and progression of renal disease sometimes slowed. Robenacoxib (Onsior, us.onsior.com) can be used short-term. NSAIDs are contraindicated in patients with cardiac disease because of lack of data and risk for acute kidney injury, especially when angiotensin-converting enzyme inhibitors and diuretics are being administered. Corticosteroids and NSAIDs both block the arachidonic acid cascade and therefore production of prostaglandins which are important for GI protection, hemostasis, and renal function. The greatest risk for acute kidney injury occurs if the cat becomes hypovolemic or hypotensive. Clients should receive information about NSAID use in cats. Clients should be instructed to stop NSAID therapy and call their veterinarian if the cat does not eat or develops vomiting or diarrhea. If anesthesia is required, blood pressure should be monitored closely and treated promptly. There is no gold standard for screening cats on long-term NSAID therapy,4 but rechecking laboratory work within a month of therapy initiation is recommended. This drug is widely used to treat neuropathic pain in many species and anecdotal reports of its efficacy in cats with chronic pain are encouraging. This tricyclic antidepressant may have some beneficial effects. Published data on the efficacy of this drug for chronic pain in cats is limited primarily because of its unpleasant taste, which can result in profuse salivation. It produces effects that include mydriasis and euphoria. Because of adverse effects (eg, behavior changes, mydriasis, inappetence, constipation), these are best reserved for treating pain flare-ups. Buprenorphine can be administered transmucosally in cats,13 making this the best opioid for this situation. Dose according to the cat’s lean body weight. Ensure accurate dosing, especially with tablet administration. Avoid administering drugs in prescription diets, as patients can develop an aversion to the taste or smell of drugs. Be aware of potential drug interactions. Concurrent use of tramadol and amitriptyline may induce serotonin syndrome. When possible, titrate to the lowest effective doses based on treatment response. Compared with young healthy cats, drug disposition, metabolism, and excretion may be altered in older cats and those with renal disease or cardiac insufficiency; this can make determining dose and dose intervals challenging. Prioritizing treatments is vital, as the number of treatments a client can administer and the patient can tolerate is limited. Both the veterinarian and client must be committed, and the full context of treatment and its cost must be discussed. Inform the client that treatment will be for the rest of the cat’s life and that there may be repeated trial and error before reaching an optimal outcome. Review with the client the clinical signs of adverse drug effects; if recognized early and treated promptly, many are reversible. Follow up and monitor the patient. What to check for and when will vary. Encourage clients to voice concerns. In geriatric cats with chronic disease, it is helpful for owners to keep notes on activity and demeanor for future reference when making decisions regarding quality of life. Assess each of its problems. Discuss treatment goals with the client. Discuss treatment cost and client role in treatment. Discuss the advantages and disadvantages of each treatment option. Develop an individualized treatment plan. Develop a plan for monitoring quality of life. Be flexible and willing to try different approaches. SHEILAH A. ROBERTSON, BVMS (Hons), PhD, DECVAA, DACVA, DECAWBM (WSEL), DECAW, MRCVS, is assistant director of AVMA’s Animal Welfare Division and professor of anesthesia at University of Florida. She specializes in pain management and animal welfare, with clinical foci on recognizing, preventing, and treating pain and is developing tools for scoring acute pain in cats. Dr. Robertson’s publications include numerous articles on opioid use in cats. Dr. Robertson has often been a laboratory instructor and speaker at the NAVC Conference. 1. Item generation and design testing of a questionnaire to assess degenerative joint diseaseassociated pain in cats. Zamprogno H, Hansen BD, Bondell HD, et al. Am J Vet Res 71:1417-1424, 2010. 2. American association of feline practitioners. Senior care guidelines. Pittari J, Rodan I, Beekman G, et al. J Feline Med Surg 11:763-778, 2009. 3. Osteoarthritis in the cat: 1. How common is it and how easy to recognise? Bennett D, Zainal Ariffin SM, Johnston P. J Feline Med Surg 14:65-75, 2012. 4. ISFM and AAFP consensus guidelines: Long-term use of NSAIDs in cats. Sparkes AH, Heiene R, Lascelles BD, et al. J Feline Med Surg 12:521-538, 2010. 5. Evaluation of a therapeutic diet for feline degenerative joint disease. Lascelles BD, DePuy V, Thomson A, et al. JVIM 24:487-495, 2010. 6. Osteoarthritis in the cat: 2. How should it be managed and treated? Bennett D, Zainal Ariffin SM, Johnston P. J Feline Med Surg 14:76-84, 2012. 7. Long-term safety, efficacy and palatability of oral meloxicam at 0.01-0.03 mg/kg for treatment of osteoarthritic pain in cats. Gunew MN, Menrath VH, Marshall RD. J Feline Med Surg 10:235-241, 2008. 8. A study of owner observed behavioural and lifestyle changes in cats with musculoskeletal disease before and after analgesic therapy. Bennett D, Morton C. J Feline Med Surg 11:997-1004, 2009. 9. A retrospective analysis of the effects of meloxicam on the longevity of aged cats with and without overt chronic kidney disease. Gowan RA, Baral RM, Lingard AE, et al. J Feline Med Surg 14:876-881, 2012. 10. Retrospective case-control study of the effects of long-term dosing with meloxicam on renal function in aged cats with degenerative joint disease. Gowan RA, Lingard AE, Johnston L, et al. J Feline Med Surg 13:752-761, 2011. 11. Corticosteroid & nonsteroidal antiinflammatory drug interactions. Dowling P. Clin Brief 3:89-92, 2011. 12. Amantadine in a multimodal analgesic regimen for alleviation of refractory osteoarthritis pain in dogs. Lascelles BD, Gaynor JS, Smith ES, et al. JVIM 22:53-59, 2008. 13. Managing pain in feline patients. Robertson SA. Vet Clin North Am Small Anim Pract 38:1267-1290, 2008. 14. 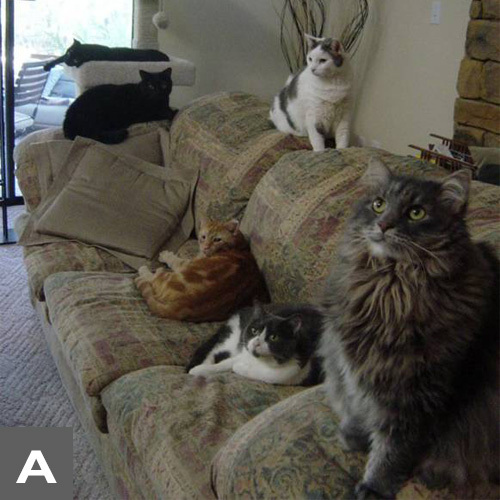 AAFP and ISFM feline-friendly nursing care guidelines. Carney HC, Little S, Brownlee-Tomasso D, et al. J Feline Med Surg 14:337-349, 2012.